So… that Spiderman Reboot is happening. He’s the man that helmed this year’s indie hit (500) Days of Summer. I don’t exactly know what about his direction made producers of the Spiderman reboot go “You know, he could bring this into the darker dimension we want”. He has style, I’ll give him that. Perhaps they just want him because they know they can manipulate him whichever way they want because he’s new. Who knows? I like him though. Anyways, he’s rumored to be most comfortably in the position. Was this merely a rumor or is there some weight to it? Anyways, he’s my definition of a secure choice. He does nothing too much with his films — Seabiscuit and Pleasantville are all by the numbers in my books — so snagging him to do a mood piece seems as logical as grabbing Michael Bay to tell an emotionally complex tale. I love this. I love Wes Anderson so him doing something so out of his element would be the best thing to happen in this scenario (for me). I don’t know how it’d play out, but it’d be a pretty interesting flick — peculiar tone, absorbing narrative, unique humor (I’d hope). This is probably not going to happen, but they mentioned his name so I got excited. 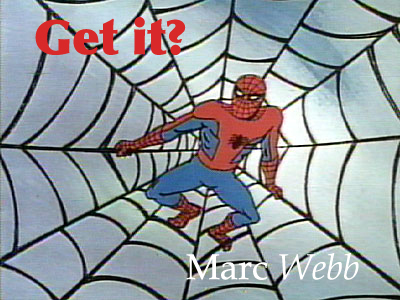 So yeah, Marc Webb seems the choice. Not too bad… plus if he could bait Joseph Gordon-Levitt into it, he’d be a pretty brilliant Peter Parker. You could even entitle this installment (500) Days of Spider and snag Zooey Deschanel for Mary Jane. Pfft, I don’t care, just make this movie so my interest can dissipate already.